Arthritis is a general term that describes inflammation in joints. Osteoarthritis, also called degenerative joint disease, is the most common type of arthritis. It is associated with a breakdown of cartilage in joints and commonly occurs in the hips, knees, and spine. It also often affects the finger joints, the joint at the base of the thumb, and the joint at the base of the big toe. Common treatment methods don't change the progression of osteoarthritis. However, two nutritional supplements -- glucosamine and chondroitin sulfates -- have been studied to determine if they can relieve pain or perhaps slow the breakdown of cartilage, which is a significant part of osteoarthritis. 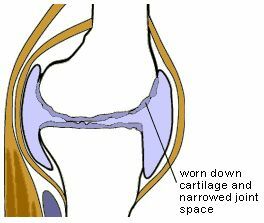 Cartilage is a firm, rubbery material that covers the ends of bones in normal joints (See Figure 1). Its main function is to reduce friction in the joints and serve as a "shock absorber." The shock-absorbing quality of normal cartilage comes from its ability to change shape when compressed. Cartilage can change shape because it is more than 70% water, which can be redistributed with movement. 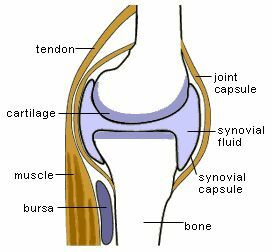 For example, when force is applied to a knee, as in standing or walking, some water from cartilage enters the joint and coats the cartilage. When the force is no longer present, such as when you sit down, the water is reabsorbed and the cartilage regains its normal shape. Because cartilage does not contain nerves, you do not feel pain when these changes in shape occur. Osteoarthritis causes the cartilage in a joint to become stiff and lose its elasticity, making it more susceptible to damage. Over time, the cartilage may wear away in some areas, greatly decreasing its ability to act as a shock absorber. As the cartilage wears away, tendons and ligaments stretch, causing pain. If the condition worsens, the bones could rub against each other. Cartilage is made up of four substances: collagen, proteoglycans, water, and chondrocytes (see Figure 2). In addition to being a key component of cartilage, the protein collagen is also found in the skin and tendons. Collagen provides cartilage with its strength, and creates a framework that houses the other components of cartilage. This substance is a combination of protein and sugar. 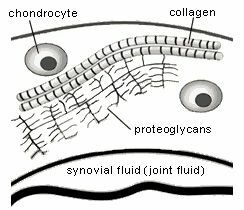 Proteoglycans are woven around and through collagen, allowing cartilage to change shape when compressed. Proteoglycans trap water in cartilage, which is redistributed with movement. Healthy cartilage contains more than 70% water. In addition to functioning as the shock absorber in cartilage, it lubricates and nourishes the cartilage. These cells produce new collagen and proteoglycans in cartilage. Chondrocytes also release enzymes which help break down and dispose of aging collagen and proteoglycans. The goals of osteoarthritis treatment are to decrease joint pain and stiffness, improve joint mobility and stability, and increase the ability to perform daily activities. Osteoarthritis is usually treated with medications, exercise, applying heat and cold to the painful joint, use of supportive devices such as crutches or canes, and controlling one's weight. Surgery may help relieve osteoarthritis pain when other treatment options have not been effective. The type of osteoarthritis treatment prescribed will depend on several factors, including a person's age, activity level, occupation, overall health, medical history, and severity of the condition. Yet, traditional treatments for osteoarthritis do not change the progression of the disease. Because the breakdown of cartilage is a significant part of osteoarthritis, researchers have been focusing their efforts on finding agents to prevent this breakdown. Glucosamine and chondroitin sulfates are two nutritional supplements currently being studied to determine their usefulness in treating osteoarthritis. What Are Glucosamine Sulfate and Chondroitin Sulfate? Glucosamine sulfate and chondroitin sulfate are components of normal cartilage. These nutritional supplements are available in pharmacies and health food stores without a prescription. They are the building blocks for proteoglycans and appear to stimulate chondrocytes to make new collagen and proteoglycans. The supplements are well-tolerated and safe. Because these supplements stimulate the production of new cartilage components, it is thought that they may be able to help the body repair cartilage damaged by osteoarthritis. However, much of the research on glucosamine sulfate and chondroitin sulfate has been done in vitro (in test tubes outside the body) and in animals. To date, there has not been any convincing proof in humans that glucosamine and chondroitin sulfates can help rebuild cartilage or prevent damage to cartilage. How Can Glucosamine and Chondroitin Sulfates Help Osteoarthritis Pain? Although it has not been proven that glucosamine and chondroitin sulfates rebuild cartilage, there is evidence from some studies that these compounds can reduce osteoarthritis pain, usually within several weeks to months after initiating therapy. An increasing number of osteoarthritis patients are trying glucosamine and chondroitin sulfates. The safety and long-term effectiveness of glucosamine sulfate and chondroitin sulfate for osteoarthritis needs to be confirmed by larger studies. The supplements are marketed under different names, with different strengths and levels of purity. Unfortunately at this time, there is no government monitoring to ensure the purity of these products. It is important to consult with your doctor before starting any new osteoarthritis treatments. Your doctor can review the other drugs you are taking and help you decide whether or not these supplements are right for you. In addition, always follow the instructions on the medication label. Do not take more of the supplements than is recommended. SOURCE: National Institutes of Health: MedLine Plus.